In the industry of technology, OTT is the acronym for Over-the-top. However this word is used in different contexts with completely different meanings. It can be referred to Facebook but also to TVs. The constant information flow in the tech industry is creating a lot of confusion between the players. I often hear and read the word “OTT”, let’s now see the different contexts and give clarity. 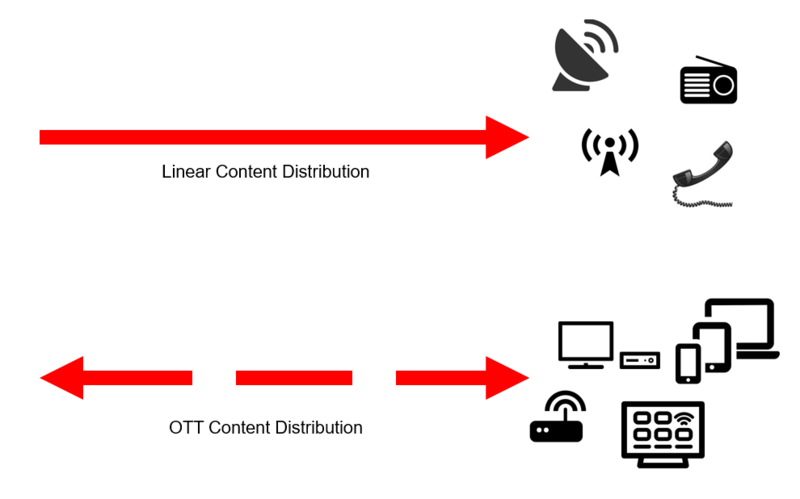 The original etymology of OTT is related to the software for content distribution. The OTT applications mainly deal with media and telecommunication way of distribution. From Technopedia “an over-the-top (OTT) application is any app or service that provides a product over the internet and bypasses traditional distribution.” For traditional content distribution, Technopedia refers to the way the video, audio or text is transmitted to the final user and passing by a cable or a line. 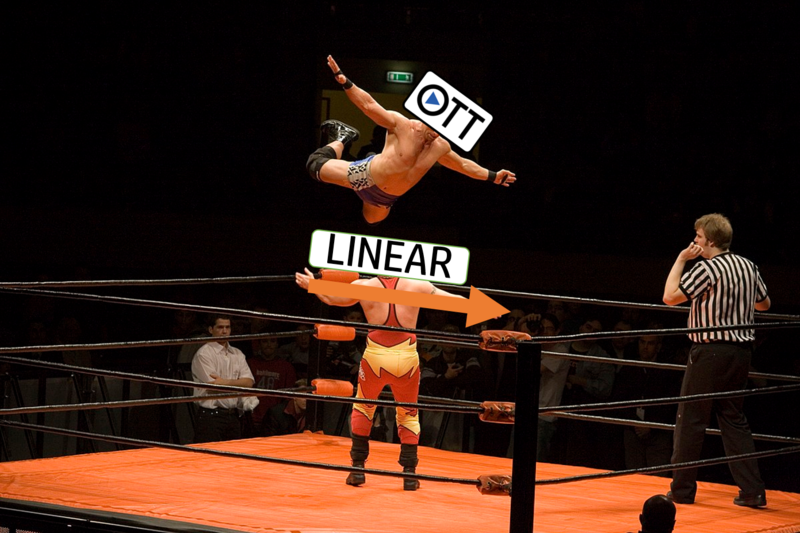 We may refer to “linear” as the opposite of OTT. Digital transmission in entailed in both applications, however with linear transmission there is a one-way input from the operator. A likely example of an OTT transmission is the webradio, where audio content passes via internet streaming. A linear distribution is more common to the many of us, it is for example the FM radio digital stream when using a radio device with antenna. User does not notice the difference, but all TVs with possibility to connect the internet have the chance to stream OTT content. The main advantage of OTT application for video is the on demand feature (VOD). In fact, if you are watching a movie via linear TV stream, you cannot decide to pause or replay the content. Bear in mind that linear TV is digital too, but it receives a constant one-direction signal from the broadcaster. For this reason, if a movie starts at 21,00 and you enter the channel with any TV at 21,30, you lose 30 minutes of the show. With OTT you would watch a movie on TV and decide when an if to start it and pause it. 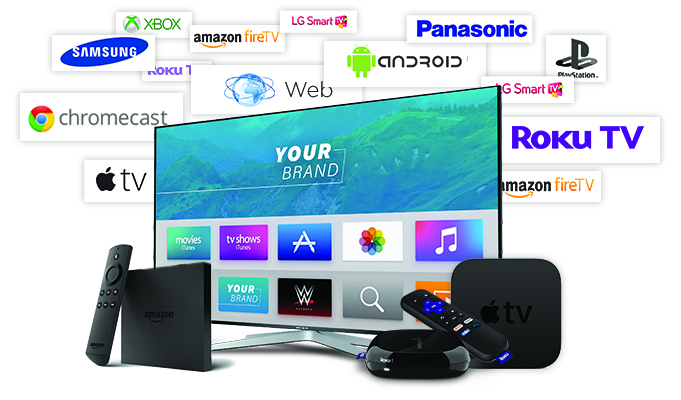 A TV device able to connect to the internet with its Operating System (OS) able to download TV apps, such as Netflix, Chili TV, Infinity. And/Or a device able to connect the internet called Set Top Box (like a Playstation, Amazon Fire TV, Chromecast). Bear in mind that not there is a OTT fragmentation of content distribution, not all OTT platforms are able to provide all content. For example, if you buy an Amazon Fire TV you cannot watch Youtube but you need to have a proper app installed in your connected TV. You can also watch OTT content from your PC, smartphone and tablet just with an internet connection. As the power of tech giants, that hold users’ data and usage time over the internet is strong, Over-The-Top definition is used to indicate the players on top of the market, that is Google, Facebook, Amazon. Contexts where you find the use of the OTT word, referred to the incumbent of the market are many. For example, in many articles and reports of the advertising industry, the word OTT is indicating the conglomerate of the top players of the industry (mainly Facebook and Google). 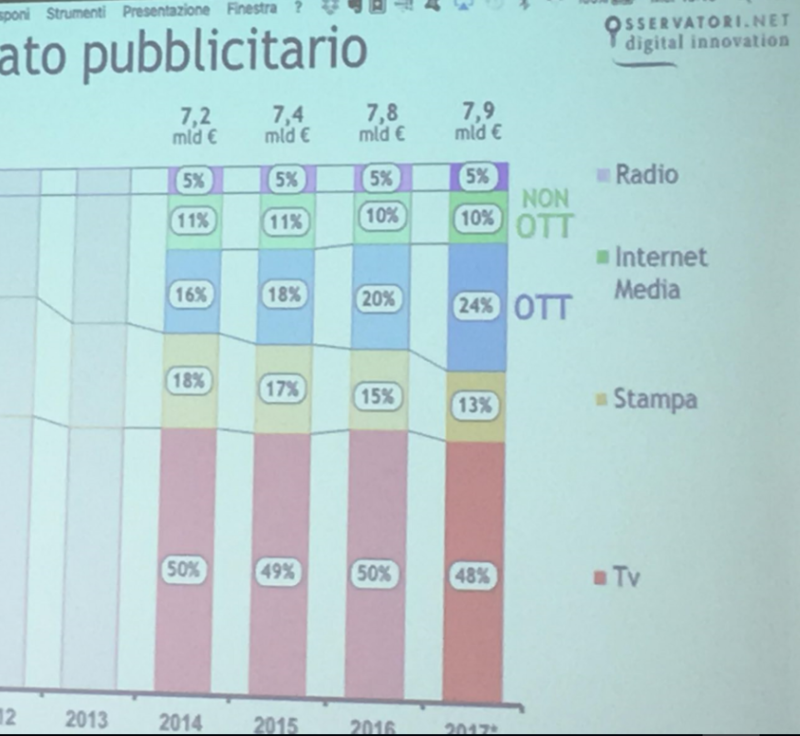 From the dec 2017 report from Osservatori Politecnico, in Italy, the 66% of the market share is represented by Facebook and Google, which in the illustration below are indeed referred as “OTT” in the context of the internet media. This OTT word use might create confusion. What does OTT include in internet media and what doesn’t? When interpreting these numbers, bear in mind the difference between the over-the-top application that distributes digital content and the incumbent of the advertising market. In fact, when reading this report you may dive into the legend and clarify what they mean for OTT. When TV advertising on OTT applications will take the leap, the readers might find chaos by using incorrectly the OTT word. in 3 years time from now, when OTT will be largely adopted by TV watchers, how will they refer OTT in the report? Please also note that in 3 years time Amazon is expected to join the duopoly of internet advertising. So better use GAF (the acronym for Google, Amazon, Facebook) in substitution of the word to identify the incumbent of the advertising market of the internet media. I would always use the word OTT referring to the more classical and technical definition of the distribution of content and avoid to create confusion in this already-confused ad industry. It is true OTT application can be also performed by Facebook, but it is not representing all its advertising business. The Facebook OTT system consist of their new streaming platform Watch. Same thing applies to Google: Youtube performs OTT streaming on connected TVs, digital devices but running advertising on AdSense it is not an OTT stream.